A plant in eastern P.E.I. that plans to produce genetically modified salmon will not require a new federal assessment, says Environment and Climate Change Canada. According to a statement sent to CBC News, the project does not involve any activity that would require a federal environmental assessment. The new facility is being proposed by AquaBounty, which currently operates a salmon egg facility in Fortune, P.E.I. In the past the eggs have been shipped to Panama for grow out. The new proposal would see a commercial grow out plant in Rollo Bay West. 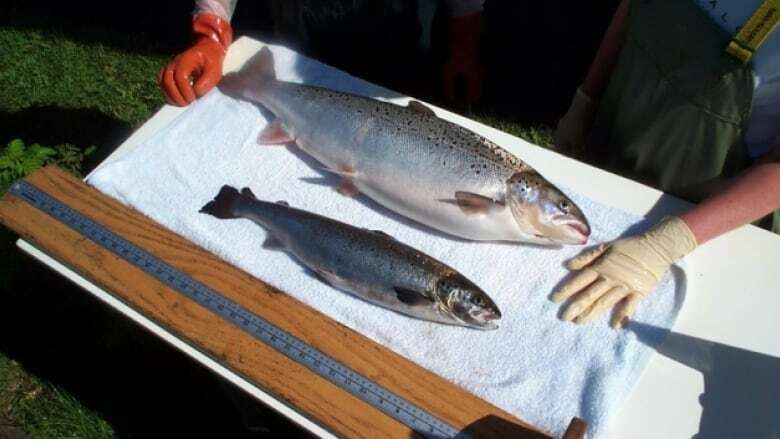 The Atlantic Salmon Federation believes the new proposal is something completely different from the egg production facility, and should have a new assessment. "I was surprised to hear [no assessment was required] because the original risk assessment that was completed was very specific and limited," said director of communications Neville Crabbe. "One of the considerations in that first risk assessment, and one of the reasons it was allowed to go ahead, was that the fish would be moved so far away." Crabbe said an accidental release of salmon in Panama would not be as big an issue, because there would be no chance of the fish intermingling with native fish in Atlantic Canada. He went on to say the procedure for making the fish sterile is not 100 per cent effective, and a catastrophic release of live fish into the environment could include a few fertile fish. AquaBounty's provincial environmental impact statement says the plant would have bio-security in place in a land-based, fully contained facility to prevent release, and that on average 99.8 per cent of the fish produced are sterile, and that not all of the 0.2 per cent are viable. AquaBounty received federal approval for commercial egg production at its Bay Fortune site in 2013. Approval to sell the fish as food in Canada and the United States followed. AquaBounty's GMO fish grow much more quickly than unmodified fish, giving the company a competitive advantage. The new provincial environmental impact statement is currently being reviewed. The federal department says it will review the provincial assessment and participate as needed. The statement from Environment and Climate Change Canada goes on to say only sterile fish can be grown, that they must be in a contained, secure, land-based facility, and the fish must be killed before they leave the plant.